Have you ever pretended something to be real so strongly or so frequently that you forget it never actually existed? For me, I’m afraid to go swimming because I’m scared a shark will eat me. I’m not even talking about in the ocean, where that is a legitimate fear, I’m talking about in swimming pools. I’m not a stupid person. I know there’s no possible way for a shark to get into my pool. There’s no way for it to survive the chemicals in the water. There’s no way for me to miss seeing it in the crystal clear water. Yet I still have that fear in the back of my mind any time I go swimming. I’m sure it started as a game. Someone would pretend to be a shark and try to “eat” the other swimmers, but fear is a powerful emotion that doesn’t need logic. That fear of sharks isn’t helped any by classic movies like Jaws. If you’ve never seen Steven Spielberg’s classic thriller, what is wrong with you? Go watch it now, I’ll wait. I love the use of the vertigo shot in this scene. It’s probably my favorite scene from the whole movie. Now that we’ve all seen the movie, I’ll keep this brief. Released in 1975, Jaws was a summer thriller about a great white shark who was terrorizing and eating beach goers of the fictional Amity Island summer resort town. This prompted the police chief, together with a marine biologist and a local shark hunter to hunt down the man eating shark. Not only was Jaws the highest grossing film of the summer, it held the title for highest grossing film of all time for 2 years before being dethroned by the original star wars movie. Despite the death of the shark at the end of the first movie, the Jaws franchise went on to make multiple sequels. The final film, Jaws 4: The revenge, was released in 1987 and, unlike its predecessor, it is considered by many to be one of the worst movie sequels of all time. It was even nominated for the worst movie of the year when it was released. 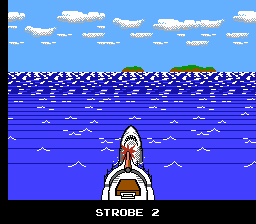 This didn’t stop LJN from producing a game loosely based on it that same year, simple titled “Jaws”. Now, when I say it was based on the movie, what I really mean is that they both feature a shark named Jaws. Actually, even that isn’t technically correct. To my knowledge the shark in the movie was never named, and behind the scenes he was named Bruce. So really, they both have sharks, that’s the only similarity. Most of the game is spent between two screens, the first being the overworld map where you sail your boat around a small stretch of ocean. Here, you will navigate between two ports to buy power-ups, as well as avoid or hunt Jaws. At first, you can only tell where Jaws is when you see his fin coming up out of the water to chase you, but your first power-up equips you with a transmitter to tell how close he is to you. The second screen is where the bulk of the actual gameplay will take place. Occasionally while sailing around, you will hit something in the water. This will apparently cause your boat to explode, forcing you to swim around in the water until a new boat shows up to rescue you. While in the water, you have the amazing ability to shoot harpoons out of your eyes. They’re clearly coming out of the diver’s eyes and not the harpoon gun in his hand. You will defend yourself mostly against jellyfish, which swim up from the bottom, as well as sting rays, which will swim side to side. While you wait for a new boat to come, you are free to kill as many sea creatures as you can. Or don’t, it doesn’t matter, just wait for a new boat if that’s all you want. you might want to kill a few of them though, because they will give you points and more importantly drop shells you can trade for power-ups at the ports. The jellyfish are the weaker of the two, and will die after a single hit. However, I found them to be much more annoying. Nearly all of my deaths were caused by these boogers of the sea. The problem is that they swim up from below the bottom of the screen. This doesn’t give you a lot of reaction time when you are down there trying to pick up your shells before they disappear. Also as you increase in power, they start to float around rather randomly instead of straight up like they used to. There are also small sharks that will occasionally show up. These guys require quite a few hits to kill, and will track you as they swim from side to side. Unlike the other enemies, once they get past the edge of the screen, they will turn around and come at you again. They aren’t too hard to maneuver around, so they aren’t a huge challenge. It’s also very beneficial to try to kill them. They are guaranteed to drop a shell, and I’m not positive, but killing one of them always seemed to activate the bonus round for me. The final enemy you can face is Jaws himself. Obviously you’ll encounter him if you run into his fin, but occasionally he’ll show up on his own if he was nearby when you entered the water. It’s sad that Jaws is somewhat of a joke in this game. He’s a huge target, he moves slower than any other enemy, and for some reason he’s unable to attack you if you are hugging the surface of the water. My whole time playing, I think Jaws only killed me once, and that was because I was swimming after him, got too close, and hit his tail. He does have a lot of health though, and your starting power level simply isn’t up to the task of killing him. Once you collect enough shells while out at sea, head to one of the ports to buy your power upgrades. There are 9 total power levels, each with increasing cost. This power level only seems to affect the damage you do to Jaws himself because the normal enemies, like the sting rays, still seemed to take just as long to kill. I mentioned earlier that occasionally you will get a bonus round, and I bring this up now because of how game breaking this bonus actually is. In the bonus round, you are flying a plane back and forth dropping cannon balls onto jellyfish swimming in the water. A good bonus round could net you 6 or 7 shells or even more if you’re really good. That’s great. You need those shells for the upgrades, but there are two problems with this. First off, because it’s a bonus round, you’re in no danger; these are just a free reward. Second, and more importantly, you don’t really need a lot of shells to begin with. To max out your level, you need 5 shells for the transmitter, and another 115 shells to max out to level 9. But maxing your level isn’t even close to necessary. Starting at level 3, you have enough power to kill Jaws if you want. It might take two encounters, but being able to hug to top of the water makes that easy. Shoot him in the face, hug the surface, and then shoot his tail. Rinse and repeat until he’s dead. Including the transmitter, you only need 13 shells to be powerful enough to beat the game. With a bonus round, you are capable of doing that far too quickly. On my final run, I ONLY played the bonus rounds, choosing to simply wait out the regular levels to avoid dying. When your bonus round makes the rest of the game obsolete, you’ve done something wrong. Once you’re happy with your power level, it’s time to go kill Jaws. It’s not as easy as just getting his health down to zero though. Once he’s out of health, you will be taken to the true final confrontation with Jaws. The screen changes to a kind of first person view of the front of the boat. Your task is to line Jaws up directly in front of the boat, use a strobe to make him leap out of the water, then impale him with the front of the boat. This is a horrible boss fight, as well as a horrible plan in real life. Sail boats don’t exactly have the ability to suddenly speed up and impale a shark leaping in front of you. The best you could hope for would be the shark committing suicide on the front of your boat by impaling itself. As for the game version, it requires such perfect timing that it borders on impossible. I spent literally an hour with a save state just practicing this 1 minute fight trying to get the timing right. That’s not fun. It’s even less fun when you run out of strobes and find out Jaws is back to full health and needs to be killed again before you can make another attempt. The ending isn’t anything to be too happy about either. Jaws sinks to the bottom of the ocean and you fly away in a plane. The End. No “Congraturations” no “A Winner is you” no nothing, just “The End”. At the end of the day, I have mixed feelings about this game. On a strictly technical level, this is a terrible game. The world map is tiny. With rare exception, the graphics are unimpressive. Worst of all, the gameplay is overly simplistic and repetitive. At the same time, it has that classic arcade charm to it, like space invaders. The difference is in the details though. Games like space invaders get a pass for their simplicity because of their age. They also remain fun and challenging because of the fact that there is no real end. You just play and play as it gets harder and harder until you eventually can’t take anymore and die. Jaws doesn’t have this benefit. The NES is still an older system now, but it was capable of so much more than what Jaws presented. Also the fact that it does have a definitive ending robs it of some of its lasting charm. The final confrontation with Jaws is really what kills this game though. It was a wonderful concept, but so poorly executed that my whole view of the game dropped to near hatred. It’s not often that a game gets less enjoyable the better you get at it, but that’s what Jaws manages to do. It was fun at first when I was terrible at it and learning what to do, but when I finally started to get good, it became tedious and annoying. Combine that with the horrible boss battle, and terribly unmemorable ending and you aren’t left with much to enjoy. I hope you enjoyed Jaws. If you did, like and follow me on Facebook. Also leave your comments, suggestions, and recommendations. If you’re feeling real generous, you can even Donate to help me keep the site going. Thank you for reading, and I’ll see you next time.